Talia the Pretty Dark Elf needed! 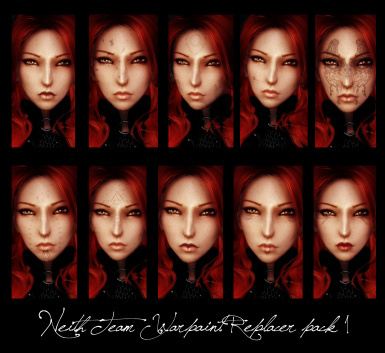 This is a pack of 46 Warpaints for females. This is a stanalone version and a replacer version will come out soon for ECE users. I plan more warpaints for both gender, but if I wait to do all that I want to do for this mod, I'd better make that mod for the next Elder Scroll! Meanwhile... You have 46 warpain, some are lorefriendly, some are not... If you like the lore of skyrim (and know how to read Daedric!) 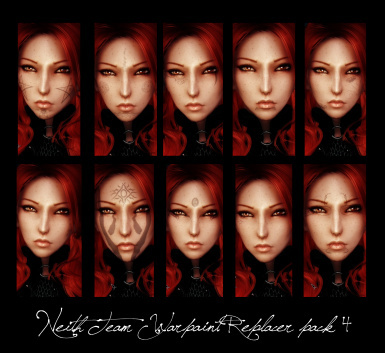 you maybe recognize some allusion and other tes lore stuff on some warpaint. I hope you'll enjoy this first set, I'm open to suggestions and requests. If there is anytrouble with this mod in your game, don't hesitate to ask for some support, I'll be glad to help! Updated: Replacers for ECE users can be download, there is 5 pack of 10 replacers. It'll replace your "femalheadwarpaint". 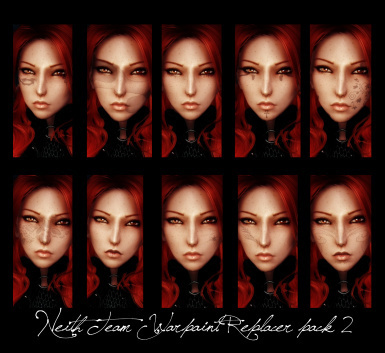 A new Racemenu version is available with four new warpaints. - Zzjay for teaching me how to deal with textures! 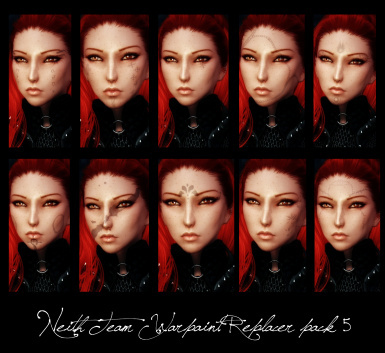 - Sayka, Kalilies, Seren, Tairen Soul, zzjay, Raven and Shocky for have been really patient and take time to test my warpaints! - Amaneith, my soul mate, my only love and my male muse for being my inspiration. 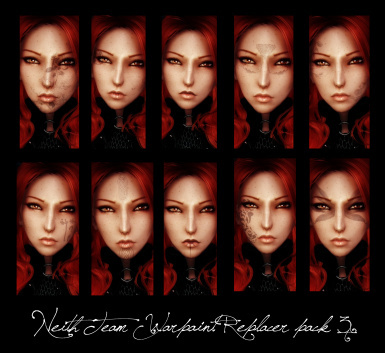 Permission: All modders are welcome to use this mod as they want, just mention the author (Ela'Neith) in the credits. And thanks to them for using it, I'm verry pleased you like it!